Is that possible to extend the functionality of the script? I would like to have an drop down list for days. Then I would select the day and drop the content… All data should be saved per day in database. I tried with mysql. Unfortunately it does not update the db content, is that a bug? @Polat – Your idea sounds feasible but it’s hard to determine where is the catch exactly. I can give you only a general answer. Anyway, If you want to have user interface “per day” (not displayed whole week), you will need to append day id (day of the week) to the database to avoid overwriting existing data. According to that, it’s needed to send day id with table content when saving. Hope this tips will help you to continue with your project. will like to be able to set up time frames for each event/content to work as a link. also how can i create a drag library quiz that will show on the left and can be drag towards the right into the calendar table. Zack’s WordPress Sandbox. i just stared looking and codes and frankly i don’t know how to put the peaces together or were to integrate them to work in my local host site . will you be able to help. if so what is your rate . Hope it will not be a problem for you. I’d want to transpose. i.e the subjects on the columns and days on the left. How can we? @AVerma – This should not be a problem. The simplest method would be to insert “days” (Mon, Tue, Wed, Thu …) as subjects to database and to change labels of HTML table in index.php. With this trick you will be able to drag days to table and to save table content. Next step can be to fix left table with days (e.g. hardcode it to HTML because week days are constant) and to insert “real” subjects to database. This change will imply adding PHP logic to dynamically exapand right table with subject columns. If you are familiar with PHP basics, that should be easy for you – source code is clean and well commented. Really wonderful and very useful. Welcome this development. I’m a starting programmer and consult if you could help me achieve that in Example 3, to position myself on the cells of the left, is shown with AJAX more information (like the example 16). Try unsuccessfully to join Example 3 and 16 and could not do. Could you help with that? @gerardo – I have prepared example and send you resulted code. You will find changes in script.js and style.css files. Hope this will be a good point for further development. Cheers! Awesome features on REDIPS, congratulations! Is it possible to create a feature like the “week” checkbox, but instead of automatically cloning an element for the entire week (row), clone it for the entire day (column)? 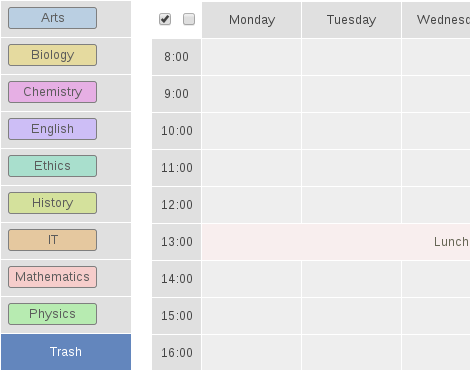 For example03, I moved the subject table to the bottom, and the timetable above it, the drag and drop seems not working. Hope you can help as soon as possible. @Gustavo – Yes it’s possible. Instead to loop all cells from one TR, you should make loop through all table rows and reference particular TD. With some basic JS skills, modification of loop from rd.event.dropped() should not be a problem. Just open script.js file and you will find the only loop inside rd.event.dropped() event handler. This is the modification point for your case. … from #main_container #left element. After this was removed, Trash cells started to work – if that was a problem. Anyway, original example was designed to have DIV sections side by side, and for your case this styles should be cleaned from style.css file. i need to contact you for a job on a similar School timetable. I’ve 10 classes with the same teachers and i need to block the insert in the same hour when the teacher is alrady signed in another class. I want to see the default timetable, if i go to the default link, but i will be able to create a link to share a created timetable. Is there any possibility to do this? In your example03, I’m dragging elements within the timetable… when I move the contents of a single cell from one place to another, how can I get the location and contents of the source cell? @Fabi – Default link to example03 demo doesn’t work because database on this site is not prepared. Instead, I have created “static” version to demonstrate how Timetable dragging works. Complete version have “Save” button at the table bottom compared to “static” version. This is great! Is it possible to have the names of subjects (English, Chemistry, etc) editable? Thanks! I am trying to implement the dynamic timetable, but I notice whenever I add a new subject to the existing subject in the database and use it in the timetable, its functions especially the trash seem to become erratic and doesnt delete a subject when I do. Please what do you think am doing wrong or might be the problem? @PD – In this demo, DIV elements contain pure text as name of subjects. It’s possible to place input field in DIV so user will be allowed to rename subject if needed. Hope this answers to your question. After page refresh, drag container will be visible. My guess is that subjects in left column exceeds out of drag container and that’s the reason of problem. Solution is to vertically extend drag container for newly added subjects in your case. Hello! Is it possible to use elements from the target cell (ie id, class) etc. after the drop for additional jquery functions?